View of North Mains henge from the air. 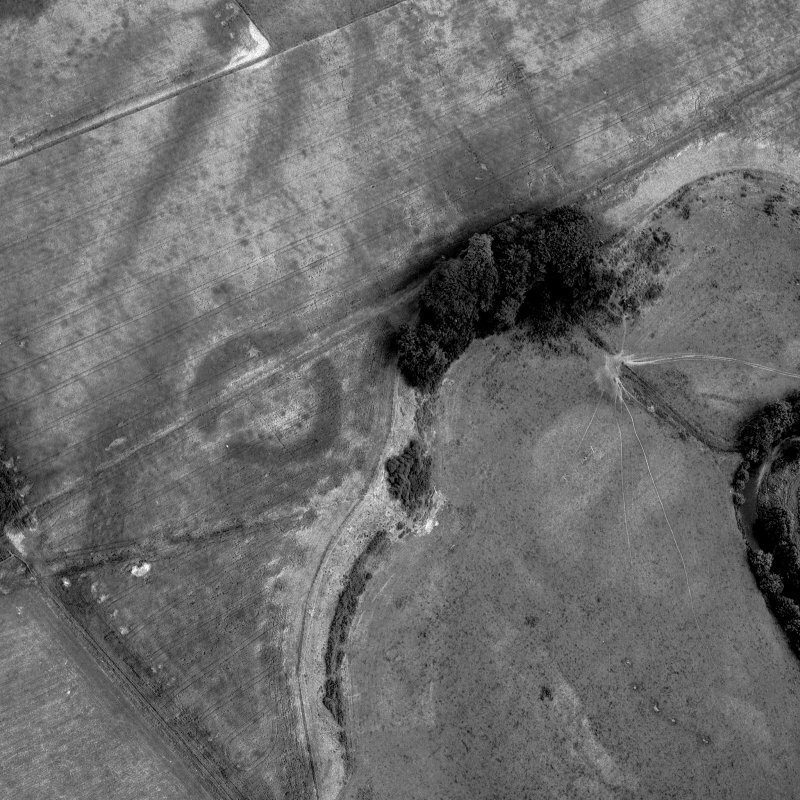 Oblique aerial view showing henge at North Mains, Strathallan. 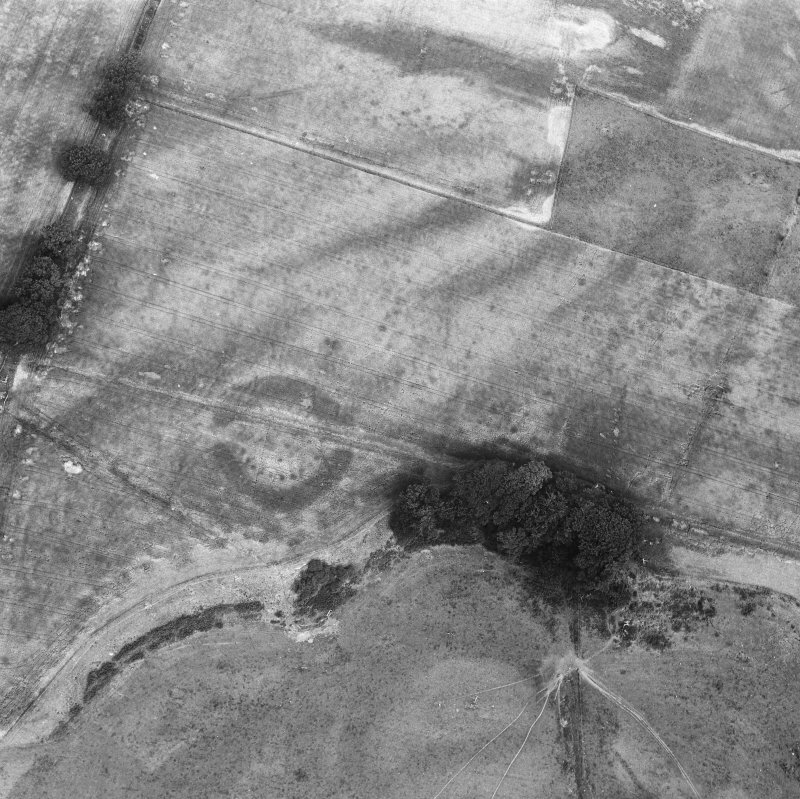 Aerial photograph showing the henge and barrow at North Mains, Strathallan. Aerial photograph showing the henge at North Mains, Strathallan. For adjacent barrow (also excavated), see NN91NW 17. NN 928 163. 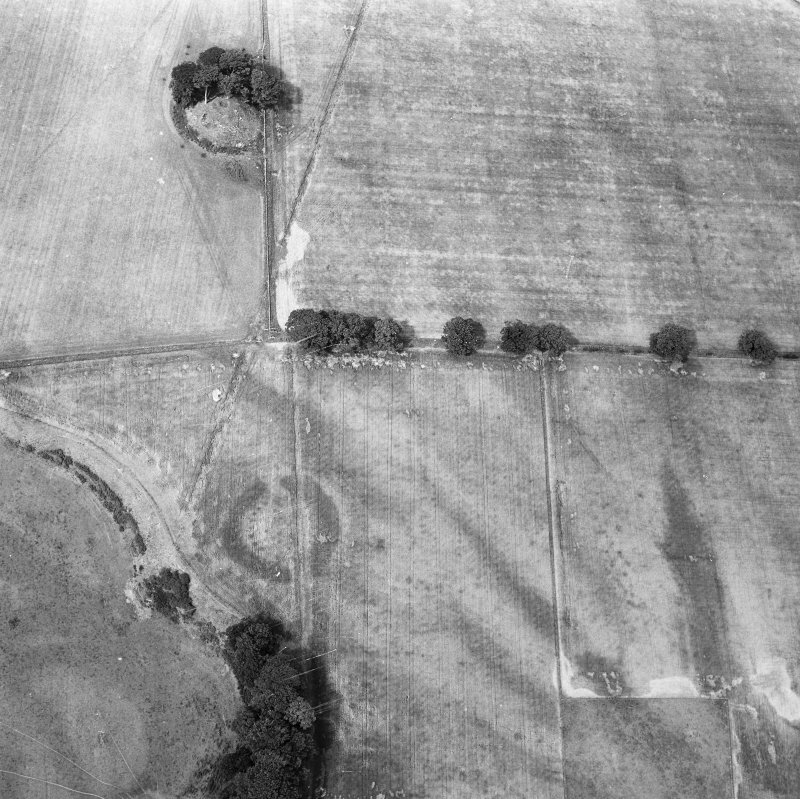 Henge (site), North Mains: This Class II henge, situated some 200m E of the neolithic round barrow NN91NW 17, and first noticed on RCAHMS air photographs (PT 5466-7; PT 5469), was excavated by G Barclay in 1979 in advance of development. A ditch, some 8m to 11m wide and 3m deep, and external bank much reduced by ploughing had enclosed an area about 30m in diameter containing two rings of pits. 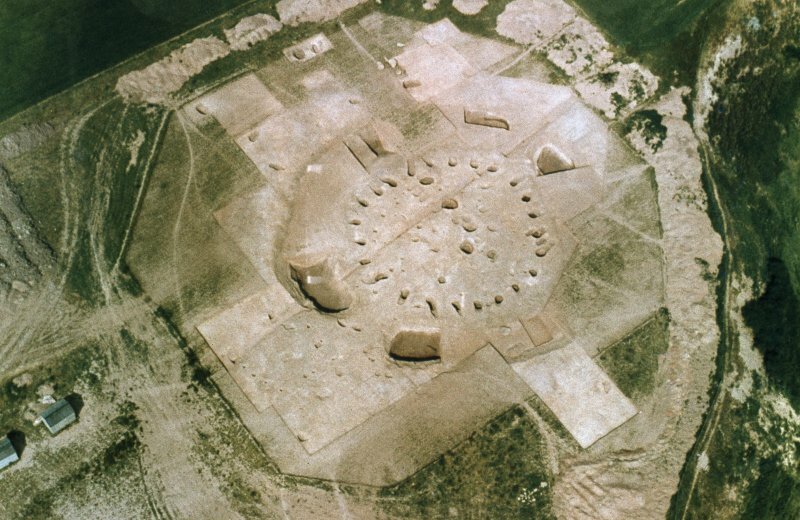 The outer (A) was roughly circular (about 25m in diameter) and consisted of 24 pits, up to 2m deep, with ramps. This ring had been disturbed at least once after the erection of massive posts in the pits. The inner ring (B) was egg-shaped and lay completely within the circuit of 'A'; it consisted of 18 pits which showed little evidence of having held posts. The available evidence suggests that ring 'B' preceded ring 'A' which in turn was completed before the quarrying of the ditch. Dispersed both within and outside the enclosure were 31 cremation deposits and inhumations both in dug graves and cists. 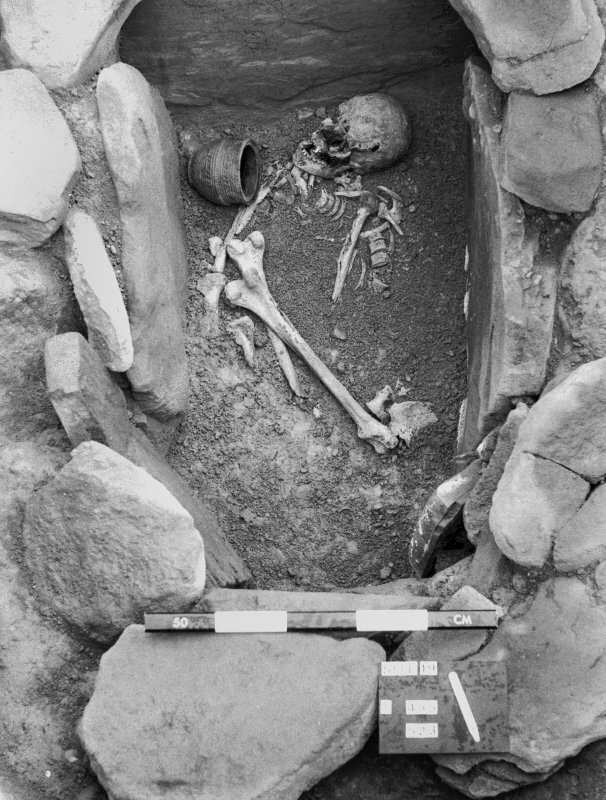 Three were accompanied by food vessels, three by urns, and one by a beaker / food vessel hybrid but 13 oriented long graves appear to represent a later (? Christian) cemetery. Further pits were found outside the enclosure including what may be interpreted as a revetment of the bank at the W entrance. G S Maxwell 1978; G Barclay 1979; 1980. CUCAP photographs of 29 July 1979 show henge under excavation. This Class II henge is plotted on a distribution map of henge monuments, ring-cairns, pit-circles and recumbent stone circles covering central and eastern Scotland (RCAHMS 1994, 39, fig. A). Information from RCAHMS (ARG) 17 October 1997.